At the end of a teaching, there is usually an opportunity for students to approach the lama to exchange a few words and to receive a blessing. During this time, students traditionally present the lama with a katta, which is a sheer white scarf used in the Tibetan culture as an offering. 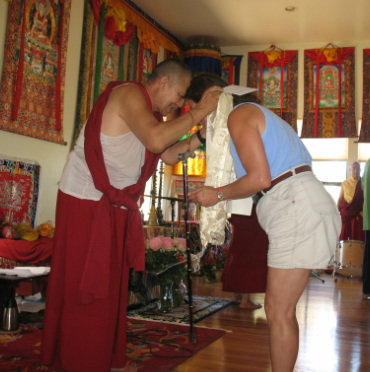 Usually the lama will return the katta by placing it around a student’s shoulders as a blessing. Students wishing to make a monetary (or other) offering, known as dana, to the lama can do so at this time. Dana is usually prepared beforehand and placed in a white or red envelope. Then, when you offer the katta, you place the dana envelope on the lama's table. Otherwise, you can give your dana to an attendant or sangha member to be given to the lama later.